Image Credit NOT Adam Block, what I thought. Does anybody know who made this image? Hind’s Variable Nebula (also known as NGC 1555, Sh2-238 or HH 155) is a variable nebula of about 4 light-years across, located some 400 light-years away from Earth at the edge of the Taurus Molecular Cloud in the northern constellation of Taurus (the Bull). The nebula was discovered on October 11, 1852 by John Russell Hind, hence its name. A variable nebula is a reflection nebulae that changes in brightness because of changes in the star whose light it reflects. 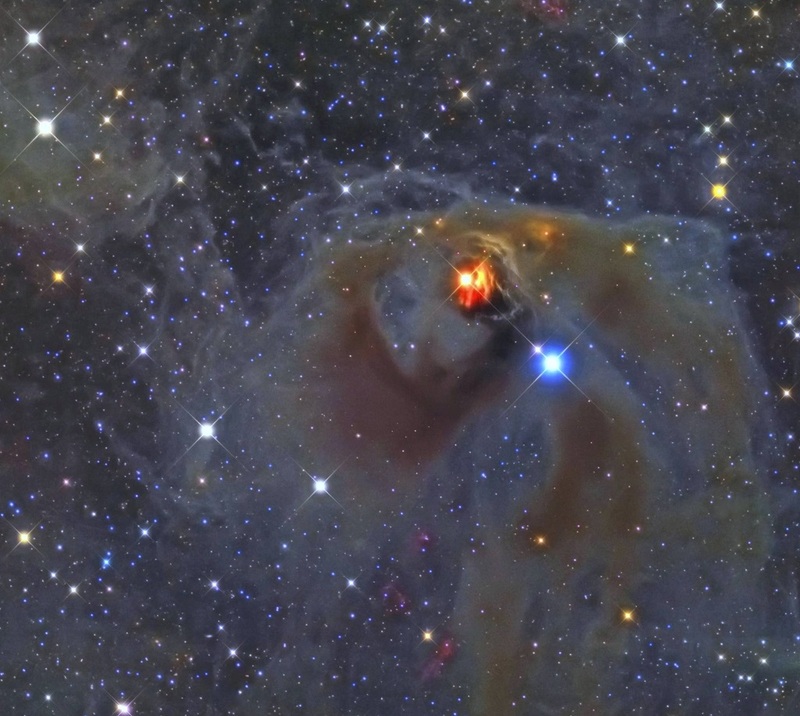 In this case the nebula is illuminated by T Tauri (the bright orange star in the image), an only one million years old variable star, ranging in magnitude from 8.5 to 13.5. This star is the prototype of the class of T Tauri variable stars, a class of young (less than a few million years old), Sun-like stars still in the early stages of formation. Both star and nebula are seen to vary significantly in brightness but not necessarily at the same time, adding to the mystery of the intriguing region. To further complicate the picture, infrared observations suggest that NGC 1555 may also contain a very young stellar object. So, the nebula is also a Herbig–Haro object (HH 155). A star forms from a collapsing cloud of cold hydrogen gas. As the star grows, it gravitationally attracts more matter, creating a large spinning disk of gas and dust around it. The disk material gradually spirals onto the star and escapes as narrow, high-speed jets along the star’s axis of spin. These narrow jets of gas and matter, ejected by newly born stars at speeds of several hundred kilometers per second are called Herbig–Haro objects (HH) – named after astronomers George Herbig and Guillermo Haro who studied the outflows in the 1950s. They collide with nearby gas and dust in the interstellar medium, producing bright shock fronts that glow as the gas is heated by friction while the surrounding gas is excited by the high-energy radiation of nearby hot stars. The jet phase stops when the disk runs out of material. After at most a few tens to a few hundreds of thousands of years after the star’s birth, the jets disperse in the interstellar medium under the action the wind produced by the newly formed star. The jets can evolve visibly over quite short timescales as they move rapidly away from their parent star into the gas clouds in interstellar space. Herbig–Haro objects are ubiquitous in star-forming regions, and several are often seen around a single star.